Been hearing some annoying hum these last weeks, just found out it's coming from my saga.. Seems to be a bit of a common issue online and in some cases people have been asked to send their unit back? Anyone here know more about this and can help me out? Merrick, LetMeBeFrank, Jinxy245 and 2 others like this. Thad E Ginathom, DigMe and Ringingears like this. rlow, Deep Funk, Syzygy and 2 others like this. I have been curious about them...an IEM over ear hybrid should have excellent isolation at the very least. These IEM's don't really fit as proper ones, it's a very shallow fit. Also the bass is enhanced by a motion feedback driver of some sort. Surprisingly enough, the isolation wasn't that good, compared to say the newest Sony cans. That ear measurement gimmick did improve the sound, but I can't really tell how much it was due to a measurement and how much due to a nasty EQ default setting. Sounds even more gimmicky than I thought. If i get a chance to try them, what the heck, but otherwise I think I'll pass. People with no headphone jack phones - do you go Bluetooth or get a usb c to 3.5mm converter? I use Radsone EarStudio ES-100 with my Pixel XL (LDAC bluetooth). I think it sounds better than the headphone jack w/ my Andromeda. The thing is impressively small, which I find to be convenient. Elnrik and Thad E Ginathom like this. Need a little advice here - I cant seem to get my svs sb12 sub to extend anywhere near it's rated limit. Have you fed it the souls of 5 virgin trebleheads? If not, try it and report back please. Any updates? I was thinking of getting one of these if more stock is found. Well, i think i had issues with the measurement setup i was using (so even a nearfield measurement right up to the cone wouldn't help me figure anything out), because I went by ear and to me the roll off sounded like it began at 41Hz so I guess that's not too bad but I can only tell how things change when I try it in another room which I haven't had the time to do. OMFG. 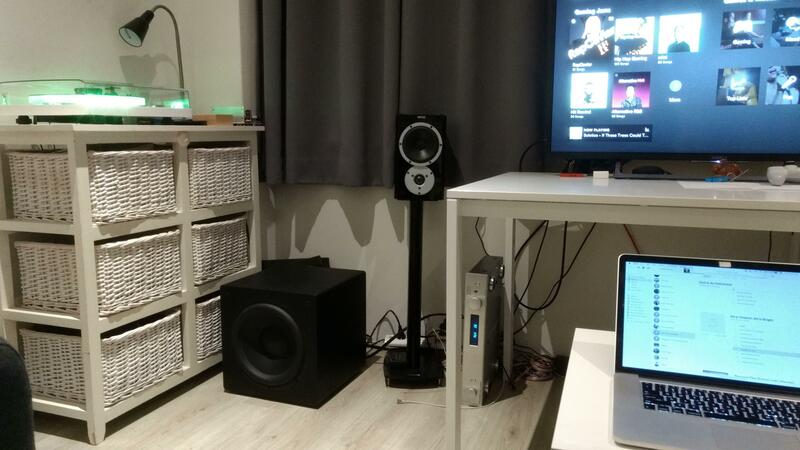 Subwoofer = best decision ever. Deep Funk, LetMeBeFrank, DigMe and 2 others like this. Which did you get? Nvm. Saw your previous post. Not sure there's a thread for this: I'm going to be getting an SVS SB12NSD and wanted to enjoy it by limiting annoyance to the neighbours.. So yeah, I'm trying to make sure I never really start the complaints, it's always the case that once that gate opens up there's no going back. Good luck with blocking out 20 Hz. I think using sand is probably the only way to go, and highly impractical. Anyone have experience with receiving money via PayPal Friend/family and then the person attempting a chargeback from their CC company? To give context - this just happened to a friend who shipped an amplifier from the Netherlands to someone in Eastern Europe. Because it smelled a little scammy we thought it was safest going the gift route in case they made a false claim but apparently not. Paypal will almost always side with the sender of money during a gift dispute. Or, well, that's what a lot of furry artist drama taught me. Also, getting "gift money" on regular intervals (as in, not using business transactions for business) will result in a swift investigation closure. Was he doing his own stuff, Blackfield, or Porcupine Tree? Super curious why the price of the BW-ES1 went up 33% since last week.. Is this variation normal on banggood/aliexpress? Irrespective of the price it sounds just crap. Mods do tighten the bass but midrange onwards it sounds really bad. Of all cheap options only ksc75 has sounded worthy . Anyone here have a cheap Bluetooth speaker suggestion under €50? Need it to break the silence when alone at the gym downstairs..
imackler, jayeshrc and fraggler like this. Bought a 43" TV, but one HDMi port didnt work. Took it back to the store and they replaced it with a 55" by mistake..
Yeah, Amazon got pretty confused when I told them that they'd sent me an extra Raspberry Pi plus case, PSU etc. by mistake at one point. @jayeshrc - wow, you're a patient man. all credit to you! Merrick and captkirk like this. 9suns, brencho and Riotvan like this. its going to be messy in my somewhat awkward 1-room studio apartment, but definitely! Pretty cool how I never had any audiophile friends before.. And then today at work I overhear 3 guys talking about dacs and amps! Dino, Deep Funk, Wilson and 1 other person like this. Landed a job, but it isnt exactly what I'm looking for. As a fresh graduate, should I take it and move later if I'm still not digging it? They're going to call me on Monday to talk about the contract (explain a few things, answer any questions i might have) and then I'll go ahead and sign it. I'm also going to tape up sheets saying "save money first, spend on audio/other random things second" all around my room for the first year. Thad E Ginathom, zonto and Deep Funk like this. When i turn the balance knob all the way to the right channel, the left channel fully fades out and the right suddenly goes on with some distortion.. Could it be a bad balance pot? Well, the amp started working properly after half an hour, then died completely 15 minutes later. Turns out the output transistors died along with the fuses and some other stuff. Luckily it had been serviced recently and that service had a warranty so it was fixed free of charge. One forum I frequent is apply-for-membership (I got in before that, of course ;) ). And yes, people are queueing up to join; trying, trying, and trying again. Even then... who knows what they will post when they actually join. zerodeefex - He self banned to have a vacation. Yeskey, PoochZag, Gaspasser and 2 others like this. I'm hoping its just a bad connection at either the bypassed diode or the bypassed power switch. gonna find a multimeter to check. Got my fingers and toes crossed!